At the start of the year, Eugene's Opportunity Village had been open just a few months, Olympia's Quixote Village just a few days, and Madison's OM Village was still just an idea. Since then, these projects have helped inspire a housing model being pursued throughout the country—a model that's beginning to seem less radical, and more practical—and a model that's therefore beginning to see substantial political support for addressing the persistent issues of homelessness and affordable housing. Furthermore, both the city and county have continued to incrementally adopt this strategy of working in partnership with local non-profits to address the issue. Following Opportunity Village Eugene, two other non-profits have emer—Community Supported Shelters and Nightingale Public Advocacy Collective—and in all, these grassroots efforts have added the capacity of 128 legal shelter spaces in either tents or micro-housing. After one year of operation in Olympia, those behind Quixote Village report that the development has been a success in their goal of moving residents towards self-sufficiency. And OM Village had their ribbon cutting in November, which created a whirlwind of international media coverage. My book, Tent City Urbanism: From Self-Organized Camps to Tiny House Villages, was released in July and nearly 1,000 copies have since been distributed. I've also been selling them at a discount in bulk through the Village Collaborative website with the intent of generating concentrated masses of local excitement around the idea, and more than a dozen cities have ordered 10 or more. Meanwhile political support is also becoming more of a norm in other parts of the country as well. New Jersey is considering a state bill (S2751) that would create a "Tiny Home Pilot Program" in which towns would be financially incentivized to allow for the building of affordable tiny houses for the unhoused and low-income. And in Bridgeton, NJ, Mayor Albert Kelly is pushing to make it happen in his city. 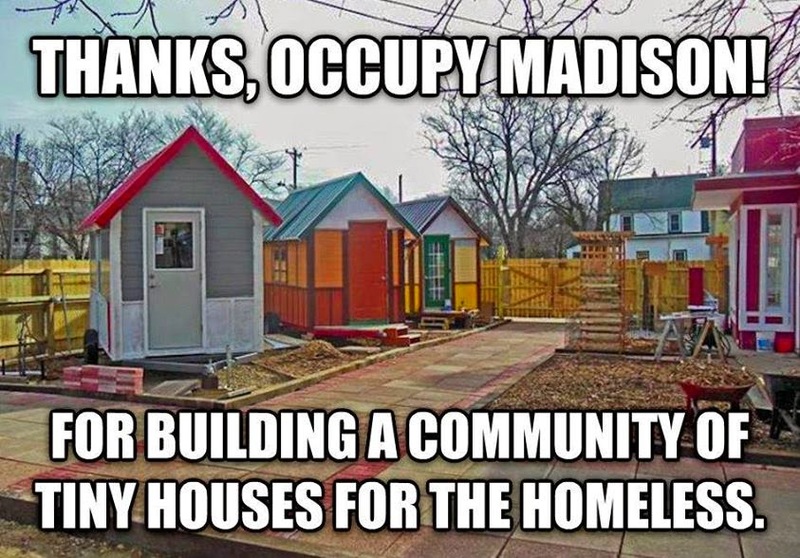 Back in Oregon, Portland's Mayor Charlie Hales has been reported to be "enfatuated with the idea" and has committed to building several tiny house developments this coming year. 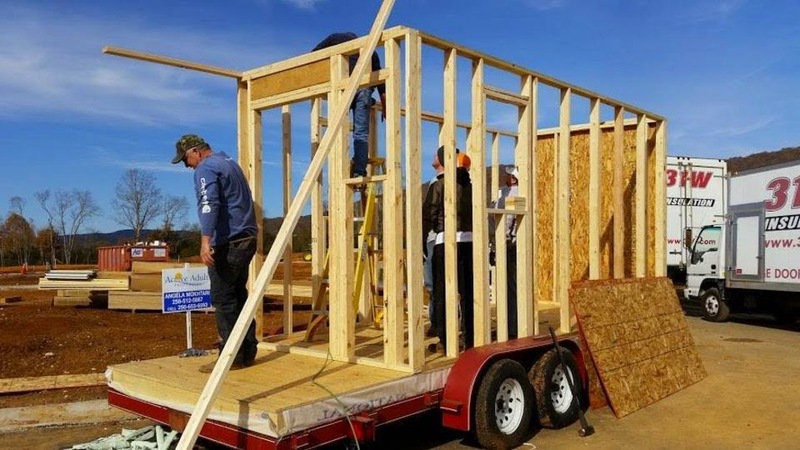 Down in Alabama, a group known as Foundations for Tomorrow is well underway in bringing a tiny house village to Huntsville. They don't have the necessary political support yet, but that hasn't stopped the group from moving forward with building their first tiny house. To capture the growing interest in this model I've put some substantial work into the Village Collaborative website over this past year. The site now includes a Tiny Village Road Map to provide a brief overview for starting a village. And thanks to Stephen Smith in Humboldt County, there is now a Village Collaborative Network map (below) that catalogs existing projects as well individuals with an interest in starting a project—with the intent of geographically networking people with similar ideas. Plus the Village Collaborative Facebook Group now has close to 500 members. So, those were just some of the highlights and progress made in 2014. This all has certainly broadened the scope of the popular tiny house movement and provided a new lens for navigating building code and zoning restrictions for tiny houses. Looking forward, I plan to work towards getting Emerald Village off the ground here in Eugene (an affordable tiny house community that will offer a next step from Opportunity Village), and to continue to consult with non-profits and municipalities to help get tiny villages off the ground in other cities as well. That said, I'm excited to see what's in store for 2015! Thanks for all your efforts Andrew! You're helping communities address important issues in very positive ways! Thanks for this great information. Tiny houses now are in trend. The idea of tiny houses is great and of low budget. But here you have shared great points. As a roofing contractor at Maryland I love to read new things. It is very important information to know how to buy houses in minimum prices. Gordon Rutty is working in real estate for many years. Nice article that you have shared about the latest condition of Tiny House Villages. Your article is very useful for us. If anyone interested to know more about the American Dream Homes, Inc.